How’s the performance of your benefits administration engine? 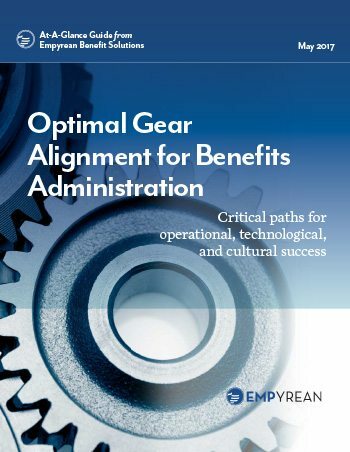 At Empyrean, we believe your benefits administration engine has three gears – Operational, Technological, and Cultural – and they must be working together for your team’s, employees’, and company’s success. If any of these gears are out of alignment due to organizational, government, or regulatory pressures – or simply having to compromise out of cost or lack-of-bandwidth issues – your whole engine’s performance is at risk. In this month’s At-A-Glance, we cover common compromises that affect these three gears. We know you are under pressure to deliver more with fewer resources. And as a result, you may be misfiring your whole strategy. Get aligned with no compromises from Empyrean. Download this At-A-Glance about Optimal Gear Alignment to help identify and diagnose the issues that don’t necessarily make the most noise, but the ones that affect you the most.